A fitting choice for those who want to strike from the shadows, the Midnight Steel Fantasy Sword possesses a look that is creative and intimidating. Numerous cutouts and a two-tone finish give this fantasy sword a striking look. Teeth run along the bottom of the black and satin blade, while an aesthetic cutout is featured near the point of the blade. 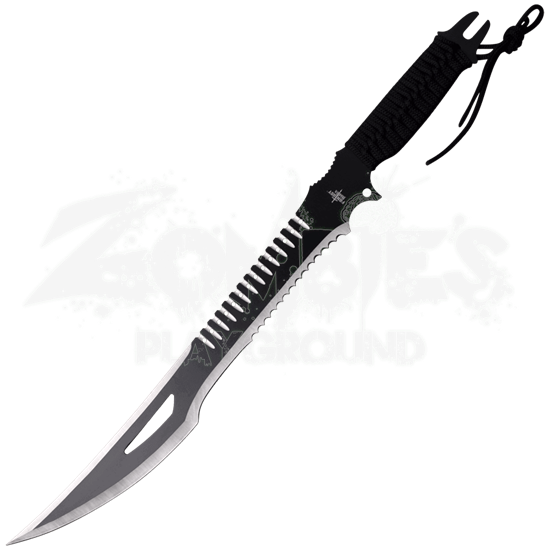 The top of the blade has a pattern of cutouts with holes, and the design of this weapon is completed with a black nylon-wrapped handle and included matching nylon sheath. This collectible blade is sure to stand out from others whether it is resting in a case or being worn as part of a fantasy costume.